What If Trump Had Asked Condi Rice to Be Veep? The New York Times Magazine’s Robert Draper has a major reported piece up today explaining in some detail the vice-presidential vetting and selection process that led to Indiana governor Mike Pence’s appearance tonight as Donald Trump’s running mate. The big attention-getter was the startling revelation that Donald Trump Jr. had told representatives of one prospect that his dad’s veep would be in charge of “domestic and foreign policy,” leaving the Boss to focus on “making America great again.” We should indeed look at Pence with new eyes, since this man we have thought of as a symbolic sop to conservatives might have a very full plate in a Trump administration. He did not exactly display nerves of steel during the “religious liberty” crisis he brought on himself in Indiana last year. But beyond this sobering thought, the names on the list of those considered for the veep gig offer some interesting what-ifs, including one big one: former secretary of State Condoleezza Rice. No, Rice was not interested, and, yes, the idea was implausible given the mutual hostility between Trump and the Bush family, much of it focused on international policies Rice help formulate and execute. But just suspend disbelief for a moment and imagine what a Trump-Rice ticket could have accomplished for the presidential nominee. It would have significantly improved three of Trump’s biggest problems: (1) the perception that he is the white-identity candidate; (2) his reputation as an incorrigible sexist; and (3) the fear that his foreign policy would destabilize the entire world and wreck America’s credibility. It would have given this convention an entirely different tone as well, to state the obvious. If Draper’s right about Trump’s desire to offload the Oval Office’s day-to-day responsibilities to his veep, an offer might have even interested Rice despite the likelihood that the man repels her. Who in the Republican Party has not had to swallow misgivings about Trump and get with the party program? Indeed, that’s the basic story line of the entire Republican National Convention. 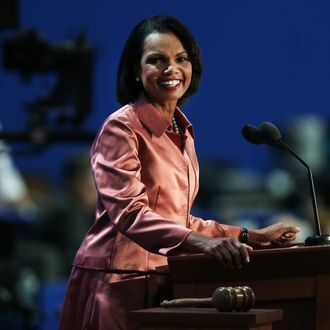 Is Condi really purer than her entire party? In any event, the biggest bar to a Trump-Rice ticket might not be either candidate’s issues with each other. The real problem is that Rice is reportedly pro-choice (though she has described her position as “mildly pro-choice,” meaning she favors some restrictions on the right to choose). That is the unforgivable Sin Against the Holy Ghost in contemporary Republican politics, at least for a national-ticket member. Perhaps Rice would have been more tempting to Republicans as a running mate than the windy and nearly incoherent former general Michael Flynn, who also called into question his reliability on abortion policy and was denounced by anti-abortion groups before being passed over in the veep search. But in the end, not even a running mate who might have changed the entire narrative of campaign ‘16 and improved the odds of victory materially is more valuable than smiting Hillary Clinton as the champion of baby-killers.